Ensure that your bugs have a safe source of water to drink! Get a small plastic bottle that has a cap, such as a travel shampoo bottle, and rinse it thoroughly to remove any residue from the contents. Poke or drill a hole through the cap of the bottle. Thread a piece of natural twine or cotton rope through the hole and into the bottle. 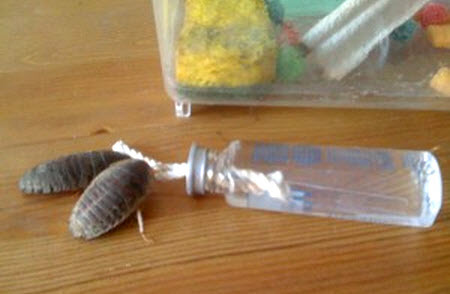 Partially fill the bottle with water and lay the bottle on its side so that your bugs can easily access the wick.